NOTE: Next Work party is 6/21 at 3:00pm. We could use a bunch of people helping to finish up the last of the trees. As you approach from somewhere else entirely, you encounter a dense, flexible wall of "trees". 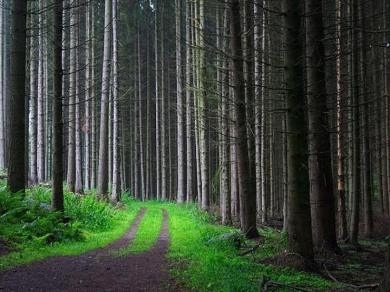 A pathway beckons you to enter, yet presents some resistance as you make your way into the forest. All sense of openness is gone, the trees push tightly around you, sounds are altered and disorientation prevails. The light is muddled and bathed with the colors of the forest. You have entered another world. You may follow the path to find its end or if you are brave enough, venture off the path to find new wonders in this surreal environment. There are secrets here. Do you dare discover them? The Sylvan Path demonstrates the differences between a guided path and a challenging journey. It illustrates that exploration in life can bring unexpected treasures. The Sylvan Path also challenges our perceptions of an open area versus a confined space and the differences in our environmental interpretations depending on our surroundings. The Sylvan Path is a large scale art project that creates the illusion of a dark dense forest. It will have several thousand "trees", a sound system for ambiance, "leaf" shade for daytime, and some nighttime lighting.